I always enjoy visiting my friends Louise and Ernie. Louise is an excellent cook, and Ernie has a great collection of wines but most importantly, we really enjoy their company. Conversation never seems to end and we always have a lot of fun. On our most recent visit, the first two courses were prepared by their 17-year-old grandson, Steven, who has been interested in cooking and eating well since he was a young child. While Steven was in the kitchen preparing, we were in the living room drinking Champagne Roses Jeanne Blanc de Noirs 2008 Cédric Bouchard, a perfect way to begin the afternoon. 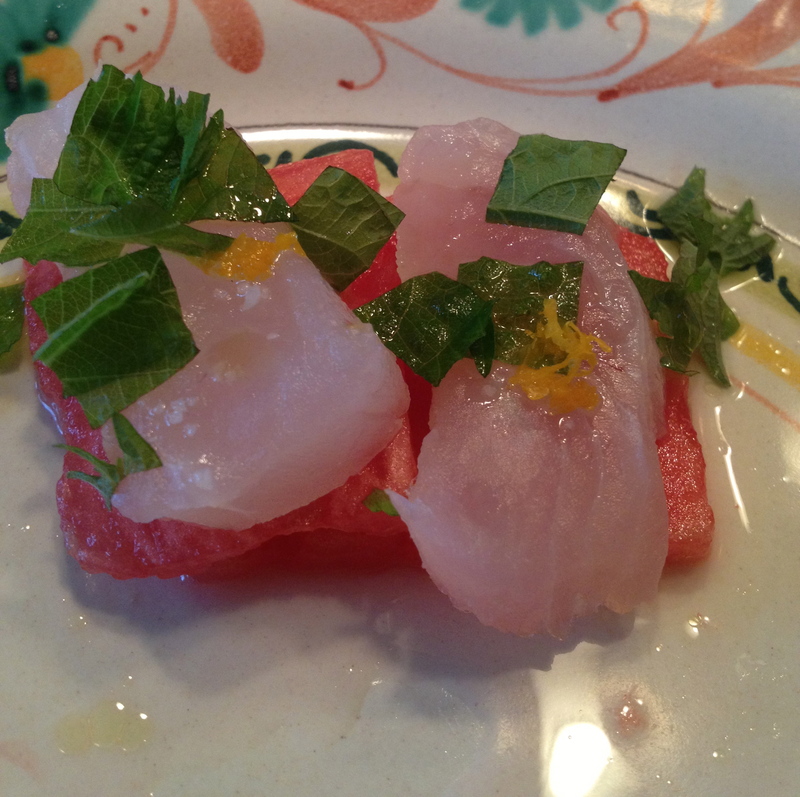 With Steven’s first course, sparkling fresh sushi with watermelon and yuzu, Ernie switched to the Champagne Roses Jeanne Blanc de Blancs 2008 Cédric Bouchard. The champagnes from this producer always impress me. I believe he only produces single vintage, single vineyard wines and that they are fermented and aged in stainless steel and the winemaker interferes in the process as little as possible. The bubbles were very small and it had a crisp, fresh taste with subtle citrus fruit flavors that would make it go very well with food. 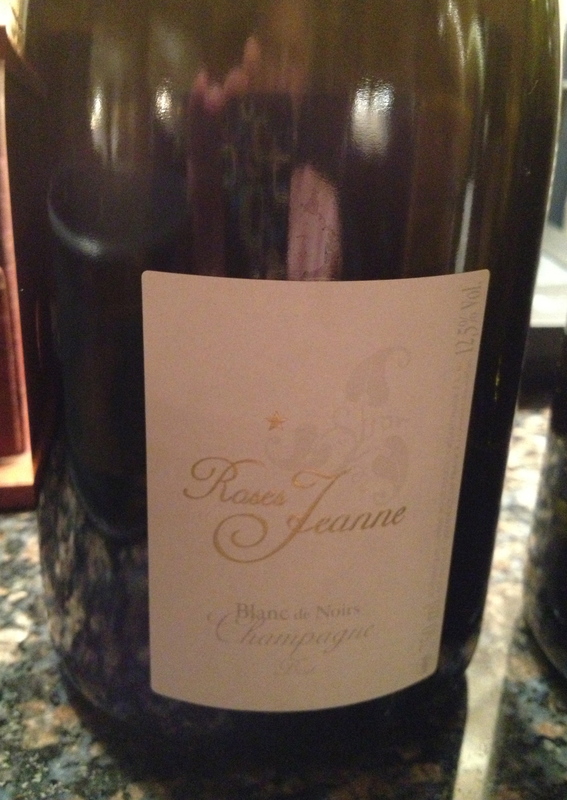 This producer also makes a Champagne from 100% Pinot Blanc! The fresh flavors of the sushi were a perfect compliment to this Champagne. With the arrival of the red wines came our next course, pappardelle with black truffles. 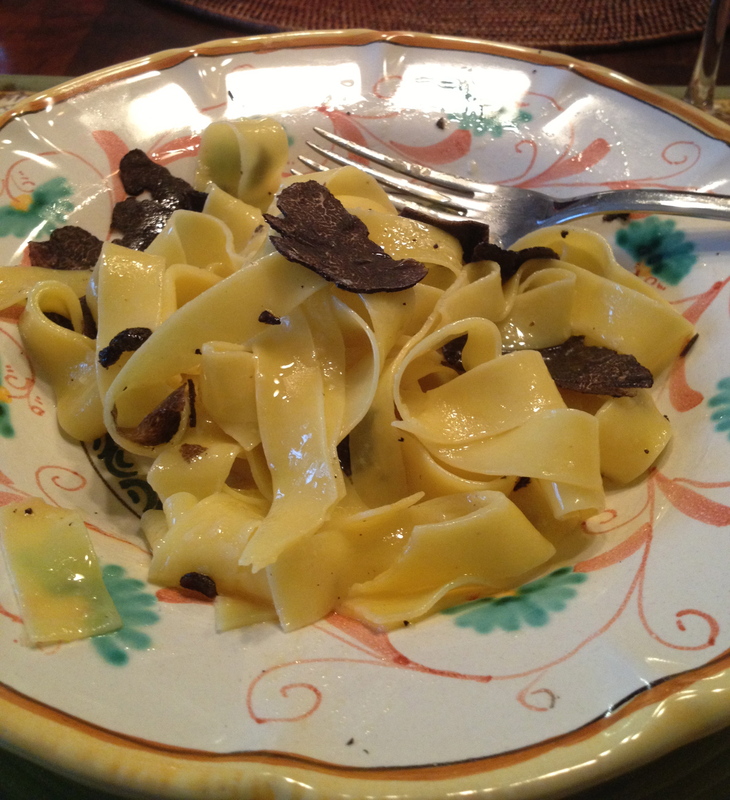 The pappardelle were cooked perfectly, coated with sweet butter and blanketed with shavings of aromatic truffles. We savored every bite and thanked Steven for the delicious starters, sad to see that he had leave for his volunteer job at a charity kitchen. Santenay Gravier 1985 Jessiaume Pere & Fils. 100% Pinot Noir. The vineyard is 4.76 hectares and the soil is hard limestone enriched with marl. The wine is aged for 12 to 15 months oak barrels, 20% new, then 5 months finishing is stainless steel bulk tanks before bottling. It is a very elegant wine and very easy to drink. 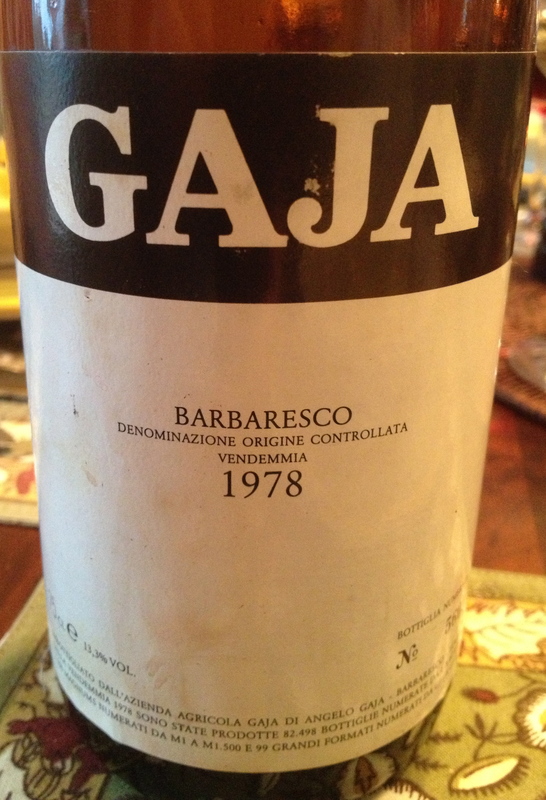 Barbaresco 1978 Gaja 100% Nebbiolo was or next wine. According to Wasserman’s Italy’s Noble Red Wines, Angelo Gaja had been experimenting with barriques in 1969. By 1976 he was in charge of the winery and began to use new techniques such as, shorter fermentation (two weeks or less), and adding 40 to 70% whole berries to the fermentation must for fruitiness and to balance the tannins and oakieness from the barriques. The 1979’s were the first wines made entirely in the new style. A few years ago at La Pizza Fresco in NYC I was fortunate to drink the 1978,1979 and 1982 side by side. There was a marked difference in the wines. The latter two wines were more concentrated and the oakieness had taken hold. They were a different style of wine. This 1978 is a great wine showing very few signs of age, with black fruit aromas and flavors and hints of leather and balsamic. 1978 was a great vintage. 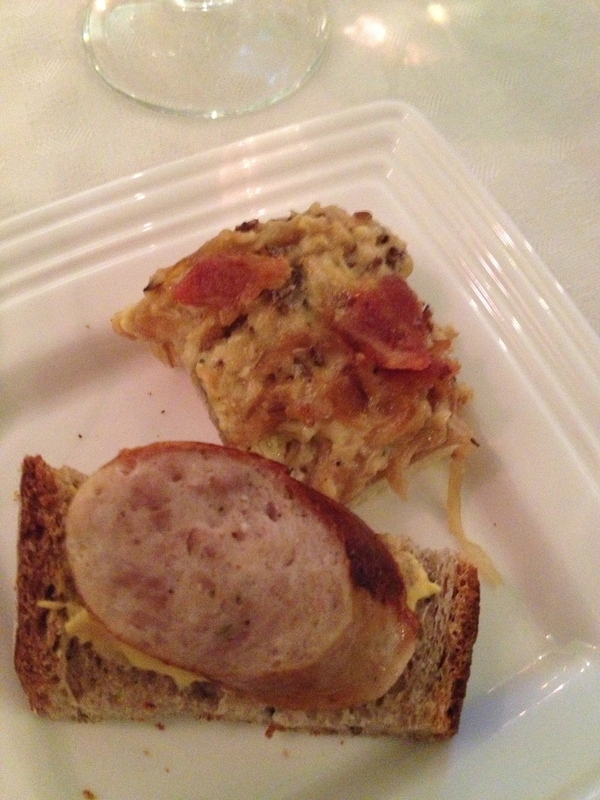 Our main course was a tender and juicy chicken breast stuffed with Fontina Valle d’Aosta prepared by Louise. 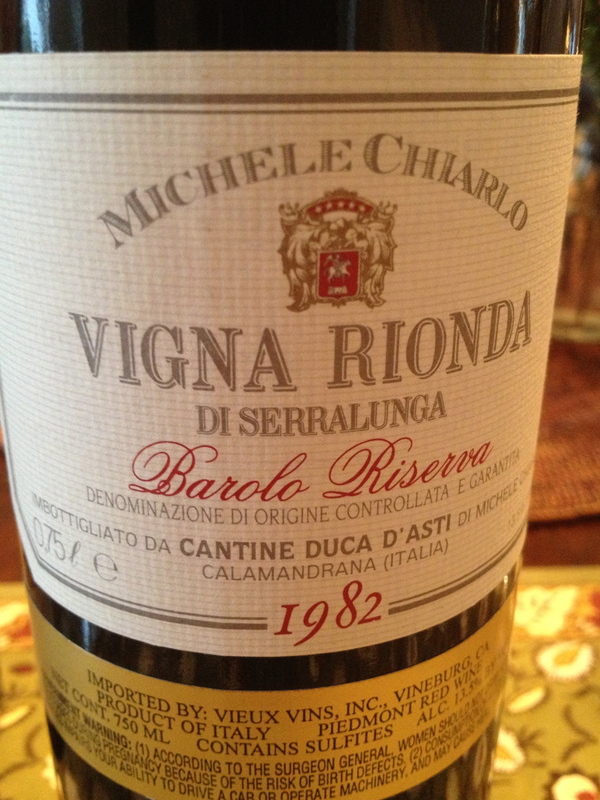 With it, we drank Barolo Riserva “Vigna Rionda Di Serralunga” 1982 Cantine Duca d’Asti, Michele Chiarlo. Made from 100% Nebbiolo (Lampia and Michet sub-varieties) Wasserman in Italy’s Noble Red Wines gives the vintage his highest rating: 4 stars. When it comes to Barolo I always felt this winery was underrated because it is better known for its Barbera and Moscato di Asti. This is classic traditional Barolo with dark fruit and hints of leather and tea showing no signs of aging. I do not believe they make this Barolo today. 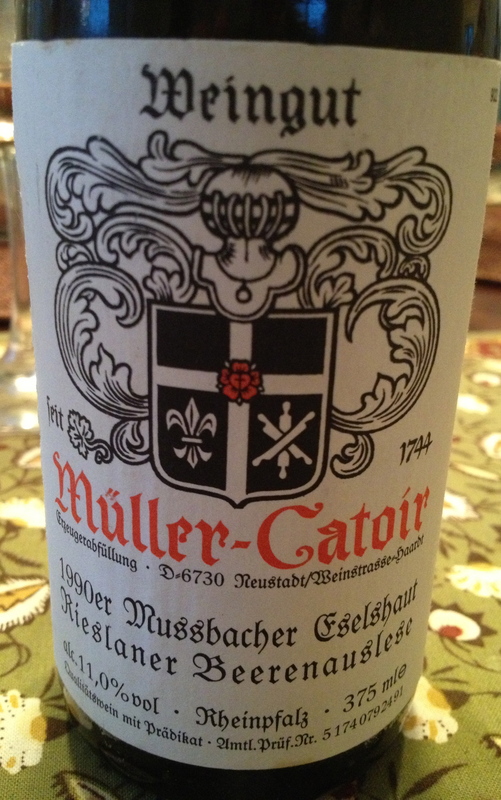 Eselshaut Mussbacher Rieslaner Beerenauslese 1990 Muller Catoir. This was a very interesting dessert wine. It was not very sweet and had hints of apricot, peach and a touch of orange and went very well with the dessert, pear tart with sicilian orange mamelade and whipped cream. Watch for Michele and I on WNYC channel 25 at SD26 for i-italy|tv Saturday at 11PM and Sunday at 1PM or catch us on line. Cooking by the Book is a place that every wine and food lover should know about. A cooking school, tasting center, team building and private party space, it is located in Tribeca. Lately, CBTB has been hosting a series of wine and food tastings called Small Bites Big Sips featuring expert speakers, a wine, beer or spirits tasting, and tapas-style dishes to go with them. 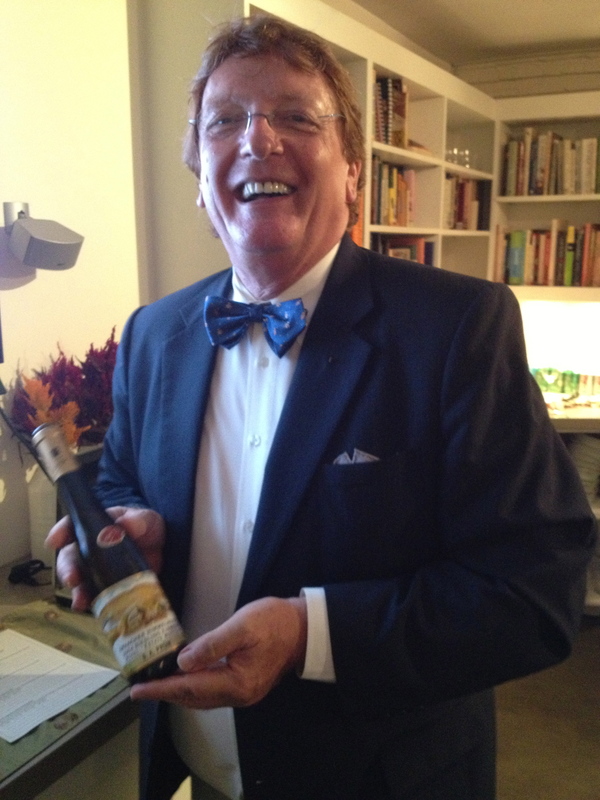 When I attended an event recently, Raimund Prüm of the S. A. Prüm Estate, located in the Mosel region of Germany, was speaking about his Riesling wines from the area. He said that grapes have been planted in this region for almost 2,000 years and his family roots in the area date back to 1156. The current estate is over a century old and is located in the village of Wehlen in the heart of the Mosel. During his grandfather’s time, the property was divided so there are a few other producers with the same last name making wine, however, he said that he was the largest producer. The region has steep slopes of mineral rich slate, rising almost from the banks of the Mosel River. Layers of slate formed millions of years ago have become vertical folds in the mountains, enabling the vine roots to penetrate as much as 50 ft down into the soft rock. The Mosel River is very important because it facilitates optimal ripening for the grapes by reflecting the sun and adding humidity for warmth. The slate retains this heat and the result is almost perfect ripening conditions for the grapes. All of the wines are 100% Riesling and the majority of the vines are 60/100 years old with original, ungrafted rootstocks which thrive in slate soil. Organic products are used for fertilizing and regenerating the soil. 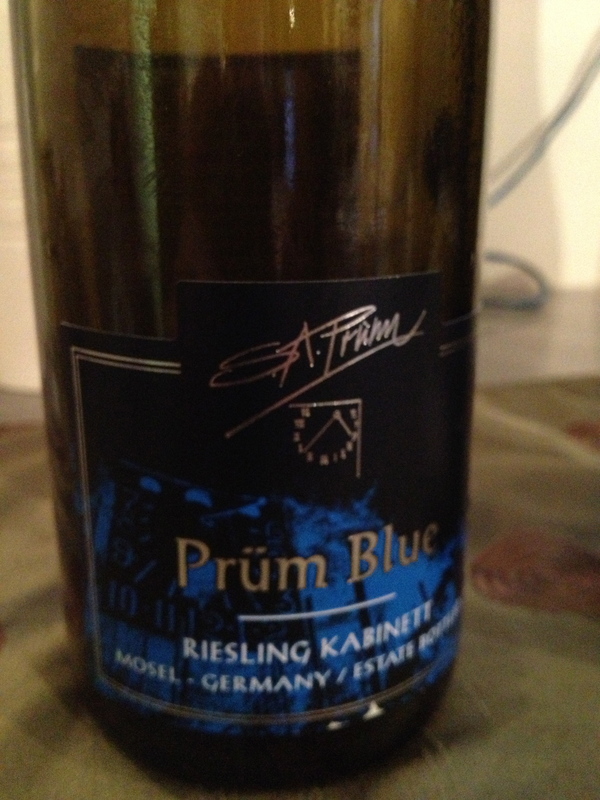 Prüm Blue Riesling Kabinett 2010 Pradikatswein, Kabinett. Mr. Prüm said the wine is named for Bernksatel’s blue colored soil, which has a copper content, and gives the wine backbone and structure. Maceration on the skins for 12 hours followed by fermentation using only wild yeast for eight weeks in stainless steel vats, aged sur lies, and bottled with Stelvin closures (type of screw cap). He considers this wine to be between a dry and medium dry. 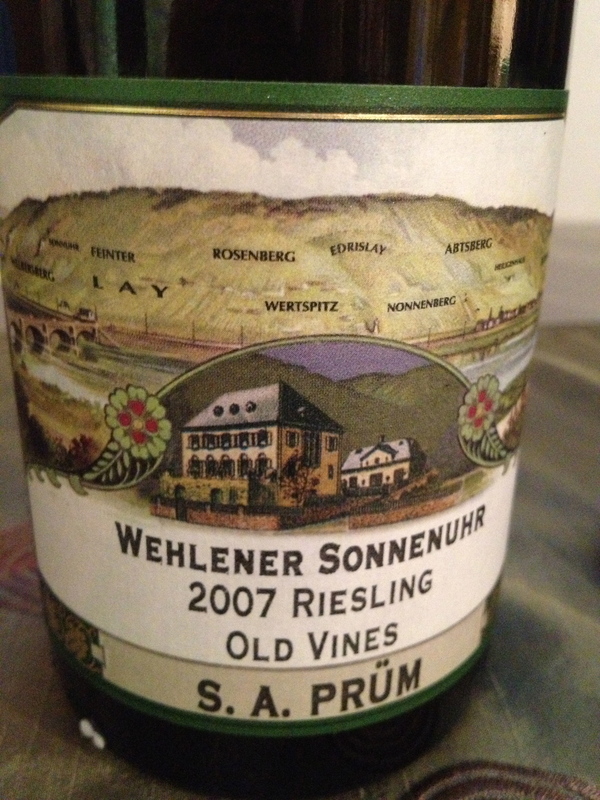 Wehlener Sonnenur “Old Vines” Dry Riesling 2007(Grosses Gewachs-Great Growth). Mr. Prüm said that wines designated Grosses Gewächs must come from Erste lage (top vineyard site according to the VDP) vineyard sites, must meets specific yield limits, attain sugar content of at least Auslese level, undergo comparative taste-testing and vineyard inspections, and be fermented to dryness. The grapes are harvested in late October, destemmed before 6 to 8 hours of skin contact, then allowed a long, slow, cool fermentation in stainless steel tanks. The wine is aged for one year in 50 to 60 year old oak casks before bottling. He went on to say that these 80 to 120 year old vines on original rootstock always express wine characteristics from Riesling grapes since they extract high minerality from the slate and transport it to the grapes. This is a dry, full bodied structured wine with depth, concentrated stone fruit and minerality. This is a great wine and was one of my three favorites of the tasting. Graacher Domprobst Grand Cru Riesling 2007 Mr. Prüm said that Graccher Dompropst Erste Lage vineyard is the steepest in Gracch. Its south to southeast exposure makes it hot and humid, giving the grapes perfect quality, minerality and ripeness, some of the vineyards still have the original rootstocks. The grapes are harvested the last two weeks in October and fermented in stainless steel. The wine rests sur lies with an additional ten months in old oak barrels before bottling. The wine has complex aromas, with slate and mineral notes, full bodied with good acidity. This is was a dry wine leaning toward medium dry and it could age for 50 years. 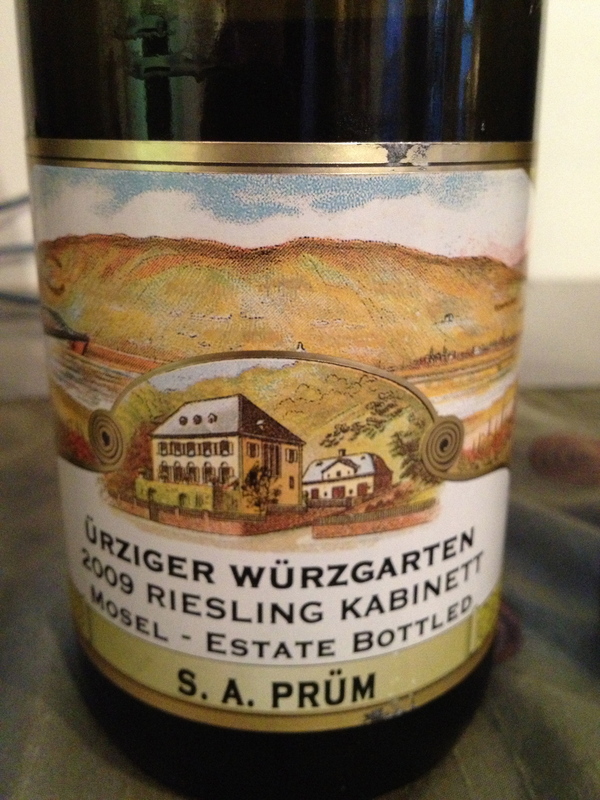 Urziger Wurzgarten Kabinett Riesling, Pradikatswein, Kabinett 2009 Mr Prüm said that the Würzgarten, meaning spice garden, vineyard in the village of Ürgiz has iron rich slate soil, which gives the wine herbal notes and a spicy warm character. Selected grapes are hand harvested in the middle of October. After 6 hours of skin contact, fermentation is for 4 to 5 weeks in stainless steel tanks. Bottled with the Stelvin closure. The wine can age for 20 to 30 years. Mr Prüm said that this was declassified Spätlese with aromas of ripe peaches and herbal notes with hints of spice and minerality on the palate. Graacher Himmeireich Spatlese Riesling 2010 Mr. Prüm said that the Graacher Himmeireich Erste Lage vineyard has natural mineral springs, which add a singular character to the wines. The vines are 60 to 70 years old, ungrafted (original rootstock) and the roots are 50 feet deep. After extended maceration on the skins and a fermentation period of five weeks with wild yeast, the wine is refined in stainless steel tanks and bottled. He said the wine could last for 40 years. It is fruit forward, full-bodied with hints of citrus fruit, rose petals and peaches. There are mineral and flinty notes and a very long finish. Mr. Prüm calls this a medium sweet wine. 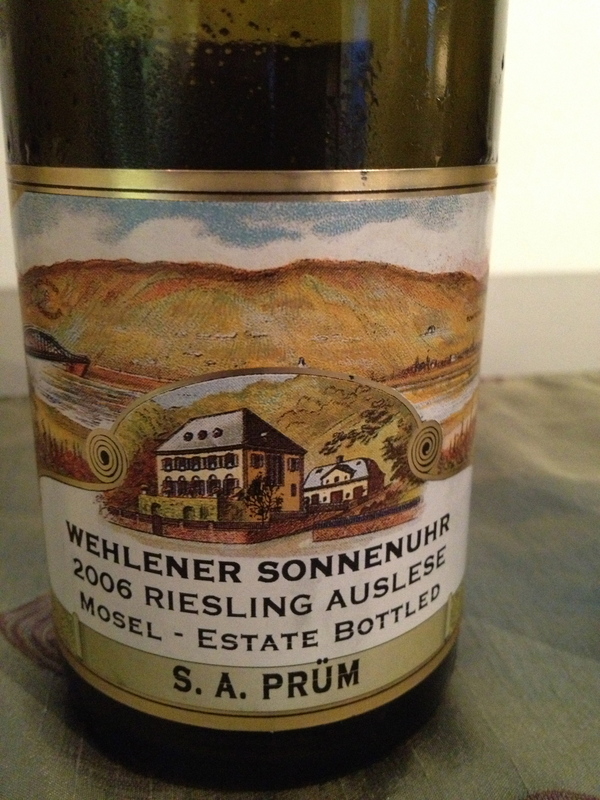 Wehlener Sonnenuhr Auslese Riesling 2006, Prädikatswein, Auslese The Prüm estate owns 13 of the 40 acres in the Wehlerner Sonnenuhr vineyard. The soil of this famous domain is composed of Devonian gray slate, with a high tin content, which imparts a distinctive, fresh minerality to the wine. Mr.Prüm said that this is the best vineyard in the Mosel region with a southern exposure. The altitude is between 425-1110 ft. with a steep 60% slope. The mountain tree line, rising above the vineyard, blocks the cold wines from entering the valley. 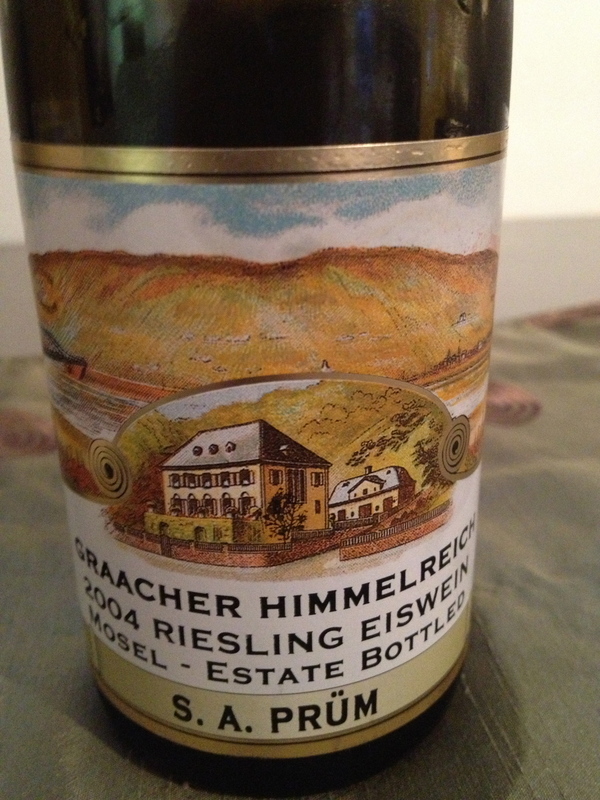 Graacher Himmerireich Eiswein Riesling 2004, Prädikatswein. Eiswein (ice wine) Mr. Prüm said that the highest part of the Graacher Himmelreich vineyard is cooler and dryer, and, in certain years, provides for ideal conditions for producing eiswein. The grape bunches are harvested while frozen in December/January. By law, grapes must have the ripeness level of at least a “BA” wine. The natural high concentrated levels of sugar and acidity are carefully preserved during the six-week fermentation process. The wine is aged in stainless steel and bottled under natural cork. He said this is a rare wine with aromas of peach, pineapple, mango and hints of citrus and lime and could age for 50 years. 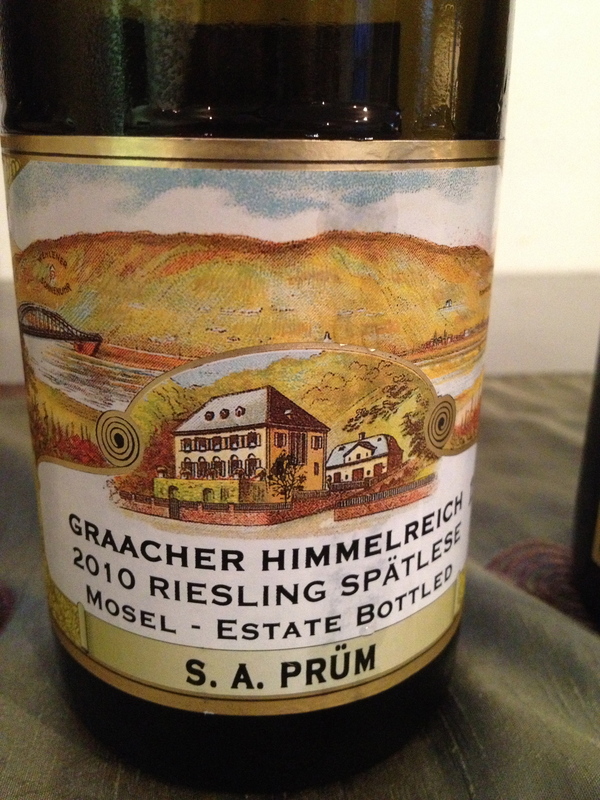 Mr. Prüm said because the grapes are picked when frozen natural yeast is not enough for the fermentation process. He said that this is a sweet wine but it was closer to medium sweet in my opinion and I liked it a lot.